Mush-a ring dum-a do dum-a da. Airish fowk know their... Whiskey in the Jar'ow. In a land not so far far away there are vast green fields, beautiful freckled redheads and great Whiskey distilleries. And many stereotypes, obviously. When you see the spelling being ‘Whiskey’, chances are it’s not a typo. There's an 'e' in 'Whiskey' when it's Irish. Historically, Irish Whiskey distillers inserted an 'e' to their spelling to differentiate their product from Scotch Whisky. American Whiskeys, both Bourbon and Rye, have in general taken-up the insertion of an 'e'. Irish Whiskey, as one of the greatest styles of Whiskey, is usually distilled three times, making it oh so smooth and pleasant to the tongue. Or as we overheard: 'The Irish are pussies, they distill their Whiskey three times'. Unfortunately, the 20th Century saw the decline and fall of the Irish Whiskey industry. In recent years Irish Whiskey started making a comeback and new distilleries are opening faster than we can ... erm... drink. 1) There are three general Irish Whiskey varieties: 'grain Whiskey' - mostly derived from corn, 'malted barley pot-still-distilled', and 'pure pot-still' or ‘single pot still’ as it is now officially known - a combination of malted and un-malted ‘green’ barley distilled in copper pot stills). Irish distillers use unmalted barley for less pronounced biscuit flavours. Irish Whiskeys tend to be super-smooth, less assertive in taste, and finish with a pleasant freshness. 3) Poteen is a Whiskey made from potatoes, in other words, it's Irish Vodka. 4) For foodies, Colcannon (from cál ceannann, meaning "white-headed cabbage") is a traditional Irish dish mainly consisting of mashed potatoes with kale or cabbage. 5) The Vikings founded Dublin in 988. 6) The Harp is the official emblem of Ireland, not the shamrock. It was St.Patrick who made the shamrock so popular. 7) 40% of presidents of United States had Irish ancestors. The Flavour Spiral™ is a quick, clear and visually-appealing way to look at the drink's flavour DNA. It's tasting notes reinvented. The Flavour Spiral™ is a unique and revolutionary way of describing flavours. It was developed by Flaviar tasting panel, industry experts, and You, our dear Flaviar community member. It is an outstanding selection of Irish Whiskeys! Getting the opportunity to taste the 18 yr Jameson was the best chance in the world. Now I’m going to be broke after only drinking that. Good box overall. Enjoyed all of them, although none will become a must stock in my home. I will say for someone that doesn’t like smoke and peat, the Connemara was a good whiskey to for someone looking to try that flavor profile. This was an excellent set. Although I was not a big fan of the peated whiskey, it was a good learning experience. The Writer’s Tears and Jameson were exceptional. This was a great journey into Irish whiskey. I thought it was fantastically put together. A friend and I went though this together in order from Writer's Tears, Jameson 18. and finally the Connemara Peated. 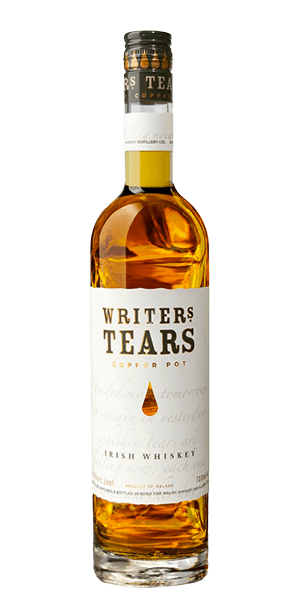 The Writer's Tears is a classic example of pot still Irish whiskey. Very bright and lively, strong notes of biscuit, butter, but surprisingly floral on both nose and palate. 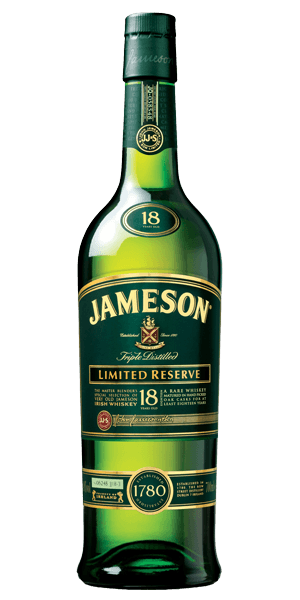 Jameson 18....I cannot say enough good things about this. This has the baseline characteristics of Jameson Irish whiskey, but it differs immediately with the inclusion of a strong baking spice note (nutmeg, cinnamon, allspice). This started on the nose and continued through the palate. This also had a wonderful leathery, musty note - like old books, all things reminiscent of well aged whiskey were present here and balanced wonderfully with spices, butter, and biscuit. The Connemara Peated: let me say I am a fan of Islay scotch and this was not a strong peat note, but a pleasant addition to a very buttery Irish. I don't know that I would buy a bottle of this one. It wasn't bad, but it tasted more like an interesting experience than something I would want to go back to over and over. This had an almost unctuous mouthfeel. Very buttery in feel and flavor on the palate. Almost to the point of being unpleasant, but not quite. And then the smoke comes in on the palate (almost nonexistent on the nose). This was a bit unbalanced but not bad. As I said, an interesting experiment, but not something I would go back to often. Overall I very much enjoyed this tasting box. I would highly recommend anyone interested in trying a large range of Irish whiskies to give this a try. You will get a classic example, a beautiful variation on that classic, and yet a further treat on your palate by combining the peat notes with traditional Irish whiskey notes. 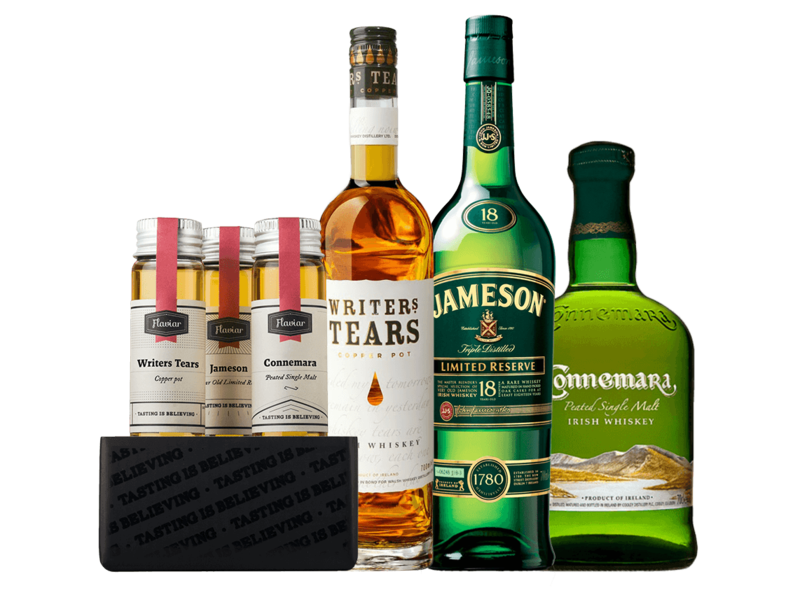 The Jameson 18yr is the absolute standout, but I will be tracking down a bottle of Writer's Tears ASAP. Great box full of Irish goodness! The “flavour spiral” is spot on. 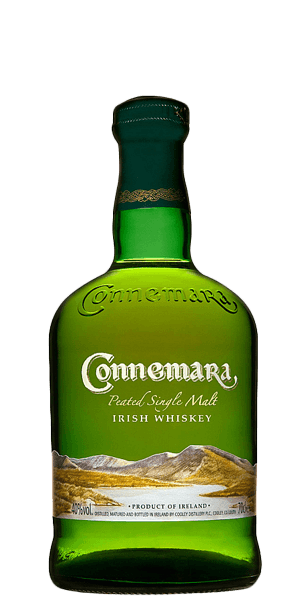 If you enjoy a earthy wonderfully aromatic smokey flavour combined with a strong fiery sweetly smooth finish, the Connemara peated is calling your name. I enjoyed it but a little too Smokey for my liking, great to taste though. Writers Tears was a fantastic sip-able full flavored wonderfully smooth treat. Would drink again as well as regularly. As far as the 18 year Jameson?? If you enjoy Irish whiskey then this needs to be part of your life. It’s color compares to any golden sunset ever witnessed. The aroma is that of the essence of beauty and fantasticalness. Drinking it warms you from the depths of your soul to the tips of your fingers. Truly a full flavored and incredibly smooth treat. I could drink this bad boy for breakfast lunch and dinner. For any true Irish whiskey fan, this deserves to be experienced. Cheers!! Jameson. Writers tears. Excellent. The third was forgettable enough that i don’t remember the name. All three are great. I love Jameson and this is right in that family of flavors, but also helped me discover the first peated whiskey I really enjoyed. I love this box. All great whiskeys. The 18 year jamesson is my favorite. It is so smooth. Great flavors. Can't find these anywhere near my house, so very happy to get a taste and check them out.